Police are to be given greater freedom from red tape and targets under a government "new deal" launched by Home Secretary Jacqui Smith. 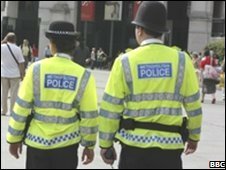 All but one of the force targets in England and Wales will be scrapped under the Green Paper reforms, allowing officers more time to tackle crime. Ms Smith said removing "top down" targets was "a significant mark" of her trust in senior police chiefs. The Tories said the government's proposals were mainly "rehashed". The launch of the Green Paper came as new figures showed police-recorded crime fell 9% in the 12 months to March in England and Wales. Speaking in the House of Commons, Ms Smith told MPs the police were at a crossroads and faced "unprecedented challenges" from terrorism and new types of crime. As well as scrapping most central targets, she said pilot plans to reduce bureaucracy would be introduced and the "stop and account" form - used by officers when they stop and question someone - would be scrapped. A further £25m will also be spent on hand-held "mobile data devices" to help cut paperwork. Prime Minister Gordon Brown earlier said the measures would mean more visible policing on the streets. "We are clearing the decks, cutting the red tape, cutting back on bureaucracy, making it possible for policemen and women to spend far more time on the beat answering people's inquiries, in touch with local communities," he said. Ms Smith also set out a new "policing pledge", which included responding to emergencies within 15 minutes, answering 999 calls in 10 seconds and attending non-emergencies within 48 hours. The Green Paper also promises to ensure the "public's voice is heard in setting police priorities". The police will offer appointments to the public to report non-urgent matters and locally elected "crime and policing representatives" will form the majority on police authorities. In addition, crime maps will give communities more information to "further empower the public," Ms Smith said. The Association of Chief Police Officers has welcomed the moves to reduce bureaucracy and said senior officers were happy they had been listened to in the Green Paper's creation. As part of the reforms, former Police Federation chairman Jan Berry - who has been a vocal critic of Ms Smith - has also been offered a job as "champion" for cutting bureaucracy. The Police Federation of England and Wales welcomed the proposals, saying that supervisors spend a large amount of their time on red tape. "The public don't want police officers in police stations completing paperwork to a beautiful standard and supplying the Home Office with statistics. "They want to see them out on the streets dealing with crime and fighting criminals - that's where we belong," Paul McKeever, chairman of the Police Federation of England and Wales told BBC News. Shadow home secretary Dominic Grieve said the Green Paper offered "some constructive ideas" but that most of them had originated on his "side of the House". The proposals were nothing more than a "string of rehashed, reheated but still half-baked announcements", he added. Liberal Democrat home affairs spokesman Chris Huhne said there was nothing in the proposals that would address "the urgent need for a consensus on what works to cut crime".